It’s been a while (nearly two years! ), I know, and what, why and where I’ve been up to is for another time… I wanted to restart my blog with a post about the fabulous Liverpool half marathon that I took part in on Sunday 28 May 2017. I ran the marathon at this event in 2014 (still my PB for this distance) and again in 2015, so I was looking forward to being back after missing out last year, although I was doing the half this time. The night before I stayed on Hope Street, which meant I had a great view of the city as I set out and a nice gentle downward amble to the start. I could feel the old familiar sensations of excitement growing as I got closer to the Echo Arena and the crowds began to swell. The queue for the bag drop looked enormous, as was to be expected, but everyone was in a good mood and I had a lovely chat with a fellow runner (checked up on her later and looks like she got a PB, hurray!). After a smooth bag drop and a trip (or two…) to the loo – one definite bonus of Liverpool is that you get to use proper flushing toilets and wash your hands with hot water and soap, no portaloo and hand sanitiser here – I headed to the starting corral where the atmosphere was positive and buoyant. A moment of silence to remember all those affected by the atrocity in Manchester was perfectly and respectfully observed, as was the applause that followed. Knowing that the city was also holding a half marathon and 10k run seemed to make the connection stronger. And then we were off. The starting waves work really well here and you are running in space from your very first step, no zig zagging around other runners required which means a fast, relaxing start to the race. One of the things I loved about the marathon was how green it made the city look and the fabulous views across the city. Doing the half, the views weren’t quite as spectacular – but the upside of course meant there were fewer hills to climb – and less park as the distance was less, but the parks we did run through looked fantastic. If I’m honest, I didn’t really pay much attention to the music, I never run with music and find it irritating in the gym when I’m forced to listen to whatever they’re playing. The only bit that stands out for me is The Beatles’ Penny Lane blasting out as we dipped in and very quickly out of the eponymous road. I still can’t decide whether or not that’s really cheesy, but it’s over so quickly, and it did make me smile. Most of the final few miles are along the seafront at Otterspool, which I have mixed feelings about. I love the view of the river Mersey, but then the bits of cobbled path are cruel on tired feet and we weave around a sort of industrial looking area briefly, which isn’t great. But then, finally, you’re back for the last few hundred metres along the seafront, and suddenly, there’s a big crowd and the noise hits you. Suddenly, you’ve crossed the finish line and received one of the biggest bits of race bling! I do like the Liverpool medals. It was great to be back in a crowd, running a race again, and I’m really hoping I can keep on track for the next one. I’ll be back with a bit about the last couple of years soon, and then it won’t so long till the next one. Over the past four weeks I have run three, really quite different, 10k races, and when I say races, I mean runs or more realistically, events. Running is so popular and so mainstream now (and that isn’t a criticism, just an observation) that the opportunity to race and achieve a PB at any big event seems to be limited. As a sport science student and someone who cares passionately that people should participate in sport I am buoyed by the number of people who take part in these events. Unfortunately, I’m also quite competitive and when I enter, I would like to achieve the best that I can. I have learnt a lesson this summer about what I should realistically think I can achieve. The first of my three was the Nike Women’s 10k in Victoria Park, London. I love that park, I run through, round and just in it a lot. The waves worked fairly well and when we were catching people on the second lap, runners did move to the side as the race rules suggested and the marshals reminded people. The worst bit was seeing a woman nearly fall as she tried to overtake someone right at the start. It was a heart in mouth moment as she went almost down, but recovered in time to save herself. With so many people crammed together at that point it could have been messy, my adrenaline levels were peaking! Next up was the British 10k, a loopy, u-turny route through central London. I did this event last year, so should have been slightly more realistic and not considered it a PB event. You start in waves, but it’s all mixed up, so if you get to the front of your wave, you get to run at your chosen pace and in space for about two minutes. Then you catch up the back runners from the wave before, then it’s a constant, catch up thing. There’s a lot of weaving in and out. I know that I could have avoided a lot of this if I’d got to the start line really early, but I’m in this awful habit of going to the loo at the the last possible minute! So I accept that it’s my fault that I’m not closer to the start. I enjoyed the route, but didn’t really enjoy waiting for my bag for almost as long as it took me to run! This run is on the top end of expense for what it is so I might not do it again, if I did I’d definitely try to think more about where I am and what is around me and not think about time. The last of the three was the Newham 10k, billed as #BackToTheStadium as you ran the final 300m on the Olympic track inside the Olympic Park. Having watched that Super Saturday with Mo, Jess, Greg and everyone, the chance to run on that track and experience the Stadium was one not to miss. It was really hot, there were slightly more inclines than I’d remembered, but it was amazing. There was surprisingly little crowd support along the route but it was fantastic. We started in waves according to our predicted times and it was one lap so the PB potential was high too. It was so exciting to enter the Olympic Stadium, but slightly confusing to discover we had to run round the bowels of the place before finally emerging onto the track. At that point, everything was forgotten. It was the most amazing feeling to run on that Holy Grail of running tracks. Crossing the finish line was such an incredible high. Follow that up by seeing my family in the crowd and a real roar as you entered the stadium it is definitely on my do again list for next year – I think you can sign up now, must do it today…. So, that’s it, the 30 days of June and Juneathon come to a close. To be honest, I’ve been a bit rubbish about blogging, but since tweeting is now an acceptable contribution, I’ve persuaded myself that I have been able to fully take part. As today was the last day, I knew I had to do a run befitting the end of the project. Given it was probably the hottest day of the year so far, I decided to choose my route carefully – parks with water fountains or understanding café owners where the main necessities. I ran 10k at 9am and it was properly hot, but great. I did feel a bit guilty turning up to yoga not having showered yet, but given it was Hot Bikram Yoga, it was pretty sweaty anyway. I’ve enjoyed reading other people’s blogs during the month and getting back to blogging, although I didn’t manage as much as I’d hoped. I’m going to try to keep it up a bit more, there’s a couple of funny moments from the last couple of weeks that I’d like to share so I’ll put them together. Finally, thank you to the juneathon team and all the bloggers and if not before, catch up with #janathon! On Saturday I wrote about my fears as I prepared to run the Rock ’n’ Roll Liverpool Marathon, after coming back from an injury a few months ago. I started running, in 30 second bursts, on February 28th, building up to 10k by the end of March. (I’d already been working on building my fitness by cycling and swimming.) Once I’d hit that distance I was fairly sure I could be marathon ready by the time Liverpool came around, and it pretty much worked. I’d been lucky enough to stay in a hotel right next to the Echo Arena, which was home to the baggage drop, toilets and next to the start line. I set off just after nine and dropped my bag then headed to the toilets – the men’s had a queue outside, the women’s didn’t! Maybe it’s me getting older, but this is a great plus of the Liverpool Marathon, you don’t need to queue, you get to use proper flushing toilets and then wash your hands with soap in hot running water afterwards! I made my way to the back of the 3:30 corral and began to feel quite emotional, a bit teary even. Then, the countdown began and the first wave went off. Just a couple of minutes later and it was our turn. I like the staggered start here, it means you have space to run from the very beginning and can quickly settle into your pace, without dodging other runners. The first couple of miles were mostly spent pulling my running shorts up as the weight of the gels in the back pocket was pulling them down. I did consider chucking them, but after a bit my sweat seemed to act as a glue to hold them up! I tried not to look at my Garmin too much and got on with enjoying the race. There are some great views across the city to be had on the way round and I enjoyed revisiting some familiar places, although I couldn’t help myself going past Goodison Park and booed (in my head) the giant posters of the Everton players hanging up outside. After covering about 10 miles on the north side of the city, we headed back down to the seafront and out to the south side. It was around the 10 mile mark that I saw my family. It never ceases to surprise me just how much of a lift seeing your supporters is. It definitely put an extra spring in my step. There are a few decent climbs on the route, but it is mostly flat, especially when you hit the last four miles along the promenade. At that point I was willing the clouds to keep hiding the sun as while it’s great to be running alongside the Mersey, there is no shade and in the heat it can be brutal. You turn off the promenade briefly just before you hit mile 26, then turn a corner and the finish line is ahead of you. At this point, I was so happy that I’d done it, I kicked on and sped towards the finish line, ending with a big smile on my face. I looked up to see my family just after the line and went over to celebrate with them. My time was 3:31:05, which I was happy with! 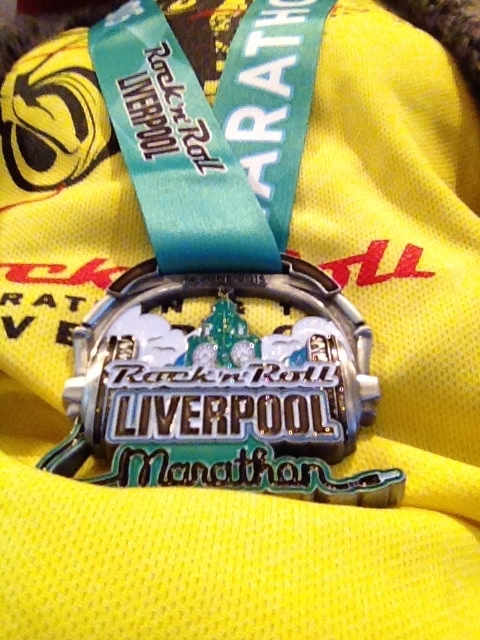 I’ve really enjoyed the Liverpool Marathon both times I’ve done it, the live music, the course, the incredibly heavy medal and the T-shirt. It’s well organised and well supported. Thank you to everyone who helped, shouted my name and high fived on the way round. I’ll definitely be back for another encore next year (in fact I’ve already booked). It’s the Liverpool Rock ‘n’ Roll Marathon tomorrow and I’m heading towards it with a massive mixed bag of emotions. I ran it last year and loved it, at the peak of my running so far, achieving a PB of 3:22:39, which I was absolutely thrilled with and hugely proud of. Training continued to go well, I completed a duathlon in September then the Royal Parks Half marathon on October 12th, just seconds outside my half marathon PB. Five days later on the 17th October, I slipped on the stairs at home, running down to get the Parmesan cheese to grate over our pasta for tea, and broke some bones in my foot, a grand total of five breaks. I should be happy that I’m back to running a marathon at all, and don’t get me wrong, a big part of me is, but I’ve lost a lot of my speed, am carrying more weight as a consequence of not doing any training for months, which also impacts my speed. I’ve trained hard for this marathon, but have consciously focused on stamina and distance rather than speed, which is fine, but now that it’s here, I’m sad. There’s no chance of going for a PB, and I don’t want to just plod round the course. So I go into tomorrow, excited to be running a marathon again, but knowing where I was last year, it feels like a shadow of that and that makes me sad. It’s a mix of being made up to be back and salt in the wound saying ‘this is where you were and you’re no where near back’. I have a good idea of how I’ll run tomorrow, race plan, time and everything, as I’ve done the training and know what I should be able to achieve, and of course I’m grateful that I can run at all and to be running a marathon is fantastic, but of course I had planned it so differently. I’d hoped to improve on last year, pushing towards the next goal of sub 3-15, the rational bit of me knows that whatever I achieve tomorrow should be celebrated, but my emotions are all over the place. Part of me doesn’t want to run at all, rather than run slowly and be underwhelmed by my time. I don’t know how I’m going to feel when I stand on the start line, I had been trying to look forward to it, but I think I was hiding the sadness. Right now, I’m fairly sure I’m going to cry, at the start, on the way round and at the finish, which is not a great look. That’s one marathon photo I definitely won’t be buying. As to my #juneathon activity today, I’m resting ahead of tomorrow, so I’m counting my morning yoga routine, 3 minute plank and traipsing round the school summer fair. I will write a race report, no matter how it goes. So we’re on day 11 and I’ve skipped a few blogs but I’ve been tweeting so that counts right? Finally, after months wondering whether I was going to make it, the Liverpool Marathon is only a couple of taper days away and I’m a mad mix of terrified and excited. Today’s taper run was really enjoyable, I left about 7.30am so it was late enough to feel happy along the canals and early enough for it still to be reasonably quiet and nowhere near too hot. In fact I had a really enjoyable 10k run and felt really positive when I got back. I’d normally top that off with half an hour on the bike, but wary of Sunday’s race – and short of time – cut it back to just 10 minutes, followed by a good amount of stretching. Might get the foam roller out tomorrow too. I’m going to really try to keep up the blogging over the next couple of days and definitely aim to get the big one done – a race report from the marathon – haven’t done one of those for ages. Can’t believe we’re nearly half way through already, I need to up my game!